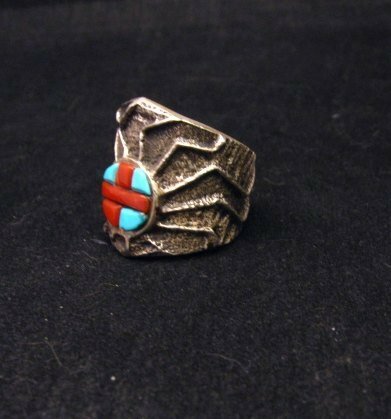 Navajo silversmith Merle House is always pushing the envelope making unique jewelry and this ring is another example of his innovative style. 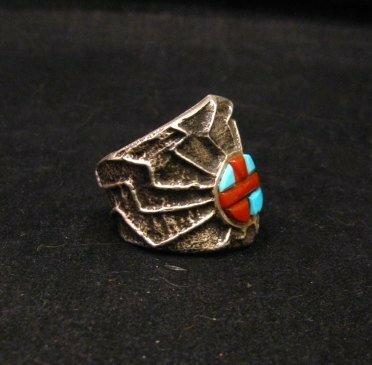 It is a silver tufa cast ring inlaid with turquoise and coral. Tufa-casting is an old Navajo technique where the impression of the jewelry is carved in volcanic stone (tufa-stone) and then the molten silver metal is poured into the impression to create the jewelry. The tufa stone is usually broken away to release the cooled silver piece, which means the piece is essentially one of a kind. Please Note: Each piece of coral has its own form, texture and aesthetic, usually with imperfections that add to its individuality. You can see these natural imperfections in the photos, which should not be mistaken for cracks. 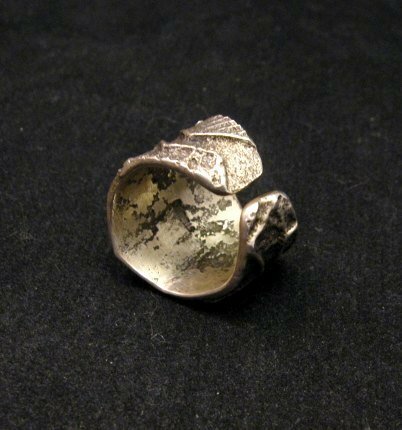 Also the "rough" looking surface on the inside of the ring is a typical characteristic of tufa cast jewelry; the ring feels very comfortable to wear. 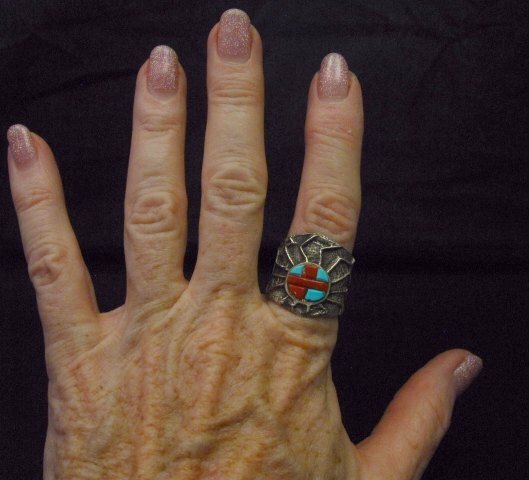 The ring measures a bit over 7/8 inch wide at the front and it is open at the back, which allows room for comfort on those swollen finger days. Weighs 15 grams. Size 8. Brand new and in perfect condition. Gift Box and Authenticity Certificate included. 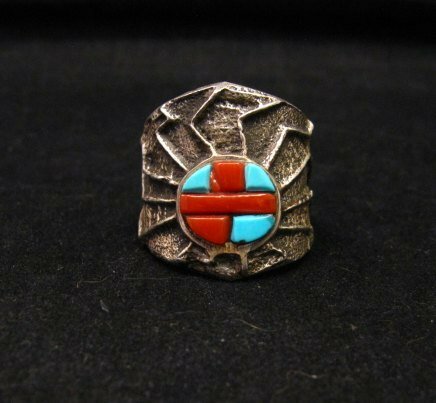 Merle House Jr. is a young silversmith who has learned silversmithing and stone inlay work from his father-in-law, award winning Navajo silversmith Ervin P. Tsosie. His jewelry is both imaginatively designed and extremely well made.